After Nintendo’s announcement two weeks ago on the retro NES Classic console, people woke up to the idea of classic gaming in the modern age on reproduction consoles. This week, stories started circulating that Sega is now firing back at Nintendo by not only releasing a retro Genesis console, but also a handheld. They make this claim by pointing out the release of a Sonic 25th Anniversary Sega portable with built in games. So if Sega is retroactively responding to Nintendo, does that mean that Atari , Intellivision and ColecoVision are also releasing their years old retro consoles in response to Nintendo too? No, of course not. What it means is that the games press is finally taking note of it. Nintendo did not break any new ground here, they simply joined the rest of the retro gaming world. Yes, Sega has done something that none of these other retro console companies have done. 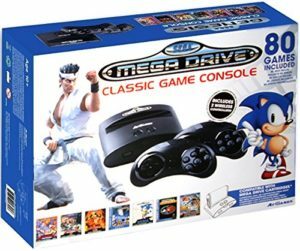 They included a Genesis/Mega Drive slot on the retro console that allows you to play even more games, none of these other consoles allow you to use existing cartridges to play games. The Sega handheld includes an SD Card slot that presumably allows you to load your own ROMs (where you get them legally, I don’t know yet). But again this is nothing new. So why is everyone writing that Sega is doing this in response to Nintendo? Because it makes for an interesting, if blatantly incorrect, headline. That is all there is to it. The writers of these headlines and articles are attempting to string as much press out of Nintendo’s announcement as possible whether those stories are accurate or not. None of this is to say that these consoles aren’t worth it if you are a fan of the systems or just retro gaming in general. They certainly are. But don’t think for a minute that Nintendo did anything innovative here. If anything, they are the one responding to existing markets. I’m looking for a SEGA RETRO THAT HAVE THE FUNNES GAMES EVER I MISS PLAYING THE OLD GAMES THANK BINGING IT BACK.